Looking for a pretty pair of flat shoes to wear to an afternoon date, peep toe flats for a nice dinner? Or even flat sandals for the hot summer days. It would like to share your time in a casual walk with this casual comfort flats. Owen Moll offer embellished, textured and casual flats in seasonal collection. All our flats combine fashion-forward thinking with a comfortable design, meaning style and comfort in every pair of flats. Our range of pumps and flat shoes are sure to effortlessly combine comfort with style. 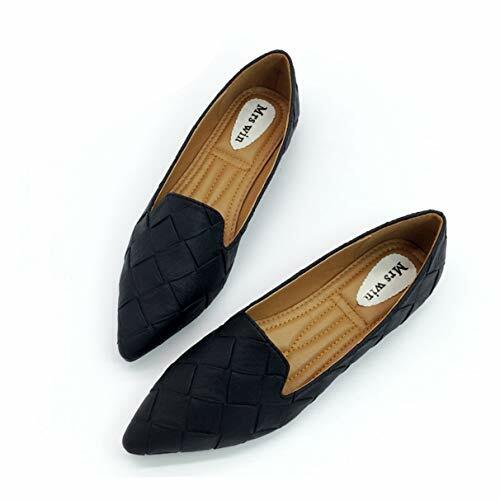 From black flats to bling flats, the wide selection, includes styles suitable for both work and casual events, easily taking you from day to night. Material: Owen Moll shoes made with the best quality materials, and designed for durability, so you can enjoy wearing them for years to come. The safe way to step out: Re-Design Non-slip rubber soles keep you on your feet even if it's wet outside. Detail measurements: See below product description, we've tried out best to provide the measurement in inches, so you can get better sizing help. If you have any questions about this product by Owen Moll, contact us by completing and submitting the form below. If you are looking for a specif part number, please include it with your message.